“Love in Lights Northwest” is a family run business based in the North West. Whilst planning a wedding last year, we fell in love with these lights. The only thing we didn’t like was the price tag, so we decided to make some Love In Lights ourselves, which we could then hire out, and share the love. We started making love back in August last year (pun intended). 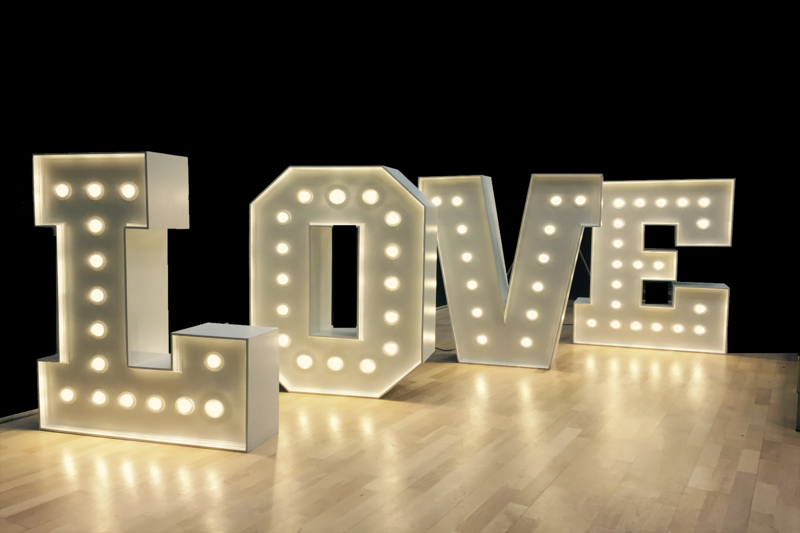 Our Love In Lights are handcrafted by myself, in my workshop and have been made to the highest specification and attention to detail, as we know how important it is to you to have your event looking amazing. One set, Love In Lights which are 4 feet tall, and the other set are just short of 2 feet (0.5m) and are perfect if you don’t have the space for the larger set. The 4ft lights are mains operated but the smaller 2ft ones are battery operated and can be picked up and held (great for photo’s) or just positioned without the worry of wires or needing a plug socket. All bulbs are LED so they don’t get hot like conventional bulbs (important when there are little fingers around) and are environmentally friendly – we try to do our bit! We are currently working on my next project which will be “Mr & Mrs” , so if “Love” isn’t what you’re looking for, please follow us on our Facebook page as they will be ready soon. We will also have a range of tabletop lights and decorations and other decorations for special events – some will be large scale!! “all you need is love!” – we love what we do and feel sure you will when you hire our products. All that is left to say is to “share the love” and hopefully see you soon.